Being the leading names in industry we are manufacturing, supplying and trading Marble Dry Fruit Tray. The products we offer are made using best quality marble by our highly skilled artisans. This Marble Dry Fruit Tray is used for presentation of dry fruits and is highly demanded due to their perfect finish and smooth texture. Our reputed entity is engaged in supplying Marble Dry Fruit Tray. We are a top notch supplier of Marble Dry Fruit Tray. Marble Four Bowl Dry Fruit Tray set. 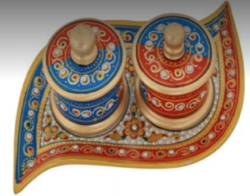 beautiful Rajasthani artician Hand Painted Golden Emboss work. A huge array of Marble Revolving Dry Fruit Tray is offer, which is extensively used for presentation of dry fruits and it is highly demanded due to its good quality. Further, the offer Marble Revolving Dry Fruit Tray is offered by us in different sizes. It is highly durable in nature and available at reasonable prices. Being an eminent organization in the industry, we are involved in providing a premium quality range of Fancy Marble Dry Fruit Tray Set. 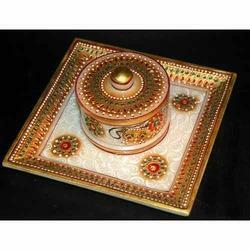 • Tray Size: 9" x 9"
White Marble Dry Fruits Box Handmade Work Art & Kitchen Decor Gift. Can be used for Kitchen, Dining room, Living room, Hotel, villa, home use, hall Flooring / Walling, corridors, vestibules of apartment or villas in the external & interior decorations. We offer our clients marble Dry Fruit Tray which is widely liked and used in every household. Intricate designs and polishing are the additional features that make it a perfect grab. Marble dry fruit serving trays with bowls. Banking on our enriched industry experience, we are able to supply Marble Dry Fruit Tray. We are amongst the most reputed names in the industry, offering Marble Dry Fruit Tray. In order to meet excellent quality standards, we are supplying Marble Dry Fruit Tray.